7 Awesome Stats from NFL Week 17 - Fantasy Football, Fantasy Football Rankings | Mac Bros.
Week 17 of the NFL season has come and gone. Let's look back at 7 feats of statistical awesomeness. 1. Green Bay quarterback MATT FLYNN set single-game franchise records by passing for 480 yards and six touchdowns in the Packers’ 45-41 win over Detroit. Making just his second career start, Flynn is the first quarterback in the Super Bowl era to pass for six touchdowns in one of his first two career starts. The Packers (15-1) are the sixth team in NFL history to win 15 regular-season games in a season. Detroit quarterback MATTHEW STAFFORD passed for a club-record 520 yards and tied the team’s single-game record with five touchdown passes. Stafford is the first quarterback in NFL history with three games with at least five touchdown passes in his first 29 career games. It marked the first game in NFL history in which both starting quarterbacks each passed for at least 400 yards and five touchdowns. The two teams combined for 971 net passing yards, the most in a single game in NFL history. 2. 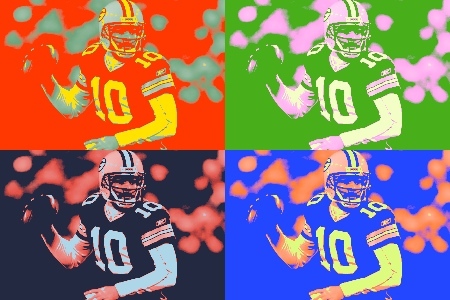 Three quarterbacks – DREW BREES of New Orleans (NFL single-season record 5,476 yards), TOM BRADY of New England (5,235) and MATTHEW STAFFORD of Detroit (5,038) – reached the 5,000-yard mark this season, more than the previous combined total in NFL history. Entering 2011, only two quarterbacks in NFL history had ever passed for at least 5,000 yards in a season (Pro Football Hall of Famer DAN MARINO, 5,084 in 1984 and Brees, 5,069 in 2008). 3. New Orleans quarterback DREW BREES completed 28 of 35 passes (80 percent) for 389 yards with five touchdowns and one interception for a 140.7 passer rating in the Saints’ 45-17 win over Carolina. Brees set NFL-single season records for passing yards (5,476), completions (468), completion percentage (71.2 percent), 300-yard passing games (13) and consecutive 300-yard passing games (seven). The Saints set NFL-single season records for total net yards (7,474) and net yards passing (5,347). 4. The New England Patriots erased a 21-0 first-quarter deficit to defeat Buffalo 49-21, the second consecutive week in which the Patriots won a game after trailing by at least 17 points. It marked the 11th time this season that a team trailed by at least 17 points and came back to win. That is the most such comeback victories in a single season in NFL history. The Patriots are the first team in NFL history to trail by at least 21 points after the first quarter and come back to win by more than eight points. With the victory, New England clinched home-field advantage throughout the AFC playoffs. Patriots quarterback TOM BRADY threw three touchdown passes and reached 300 in his 161st career game. That is the third-fewest games to reach 300 career touchdown passes, trailing PEYTON MANNING (157 games) and Pro Football Hall of Famer DAN MARINO (157). 5. For the 16th consecutive season, at least five teams will qualify for the playoffs that were not in the postseason the previous year. Six teams – San Francisco (13-3, NFC West champions), Houston (10-6, AFC South champions), Detroit (10-6, Wild Card), Cincinnati (9-7, Wild Card), Denver (8-8, AFC West champions) and the winner of tonight’s Dallas-New York Giants game (NFC East champions) – did not make the playoffs in 2010 but have done so this season. 6. New England tight end ROB GRONKOWSKI had eight catches for 108 yards and two touchdowns and New Orleans tight end JIMMY GRAHAM had eight catches for 97 yards and one touchdown. Both Gronkowski (1,327 yards) and Graham (1,310) passed Pro Football Hall of Famer KELLEN WINSLOW (1,290 in 1980) for the most receiving yards in a single season by a tight end. 7. New Orleans’s DARREN SPROLES had 168 combined net yards (54 kick return, 45 punt return, 40 rushing, 29 receiving) in the Saints’ victory. Sproles finished the season with 2,696 combined net yards (1,089 kick return, 710 receiving, 603 rushing, 294 punt return) and passed DERRICK MASON (2,690 in 2000) for the most in a single season in NFL history.